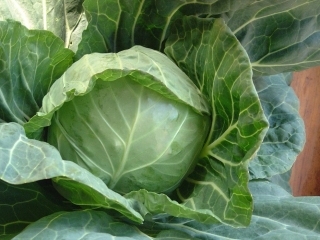 It is recommended for forcing and outdoor production, it has short growing time (60-65 days), large productivity, excellent variety for fresh consumption. 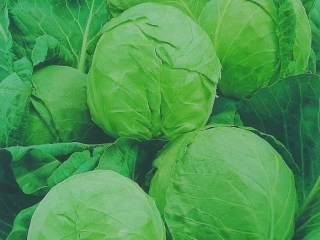 Head is spherical, greenish white colour, medium solid, average weight is 0,8-1,2 kg, resistant against Fusarium. 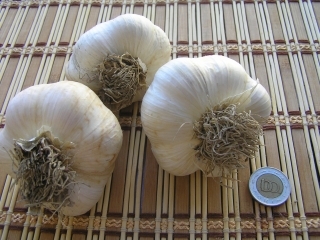 Early globe greenish white, dense headed variety, maturity days 60-70, for fresh consumption. Average weight, 0,8-1,2 kg. 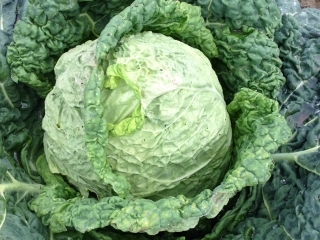 Suggested for growing in open field and early production under non heated plastic tunnel. 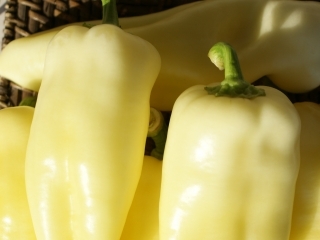 Medium early globe light yellowish green, dense headed variety, maturity days 65-70, for fresh consumption. The inner stem is short. Bursting is late Average weight, 1,5-3,5 kg. Tolerant against arid climate. Suggested for growing in open field. 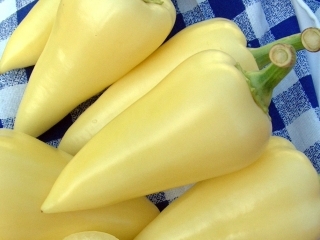 Late flattened yellowish white, dense headed variety, high yield maturity days 120-130, for storage and processing. Bursting is late. Average weight, 2,5-4 kg. Suggested for growing in open field. It has short growing season, middle-strong growth, suitable for plastic-house or early outdoor cultivation. Yield is flattened round, ribbed. Its skin is thick, silver-yellow with darker spots. Flesh is light orange, light aromatic, good quality. Thickness of flesh is 5-7 cm. Weight is 1-1,5 kg, 2-3 pcs per stool. It provides excellent quality on sandy soil. Andromonoic flowering. 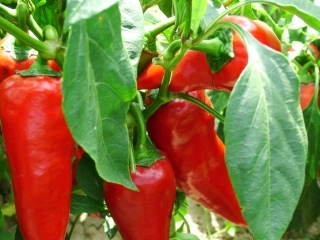 Long-term culture medium, constantly growing, fertile, forcing unheated foil and recommended for cultivation in open field, hot paprika. Berries strong stalks, flattened globe-shaped aperture, 3-4, yellowish-white, anthocyanin colouration is not susceptible to 85 - the average weight of 100g. Flesh 6 - 8mm thick, spicy hot. Mainly gherkin, but cooking and consumption of fresh meat quality is excellent. 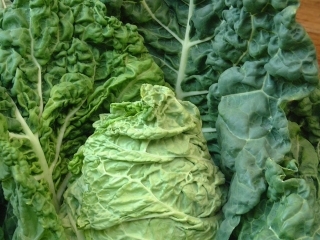 Constantly growing, vigorous growth, can be harvested 1 week earlier than HRF, extremely high yielding, for filling. 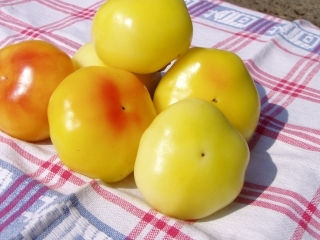 Fruits are whitis yellow coloured, mildly ribbed, erect, characteristic hot. Unique in earlyness but does not get the worst of productivity as well opposite of "professional" variety. Recommended for outdoor and glasshouse production. 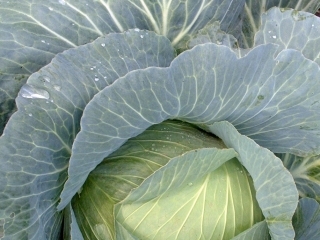 Constantly, vigorous growing, extremely high yielding, suitable for filling. Fruits are pendent setting, regular cone-shaped.Fruits are yellowish with thick, hot, aromatic, crunchy flesh. It materialize the real HUNGARIAN style variety. It can be kept on counter a quite long time without any waste of substance. Excellent either for outdoor or glasshouse production. 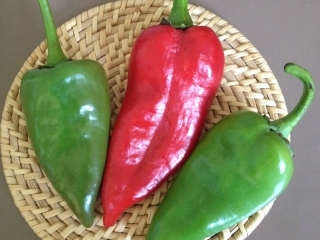 Constantly growing, flattened globe-shaped, white to yellowish-red exposure, spicy berries for fresh consumption, canning processing for pickling. For decades inimitable. 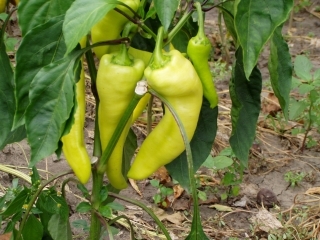 Recommended for glasshouse and early outdoor production, constantly growing, light-green, hot type. Fruits are hanging, long, husky, spicy hot. 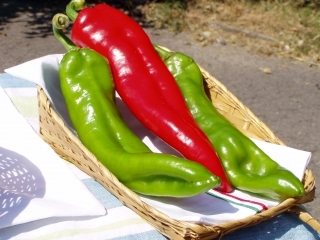 Extraordinary delicacies as stuffed sweet pepper. 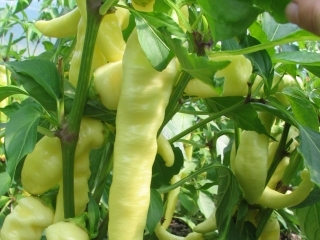 Constantly growing, light-green, pointed, hot type, extraordinary high yielding for glasshouse production, but excellent for outdoor production as well. Masterful for either fresh consumption or pickling. Constantly growing, it has excellent renewed ability. 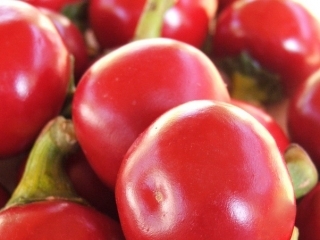 Fruits are cherry shaped, deep-red colour, strongly hot. 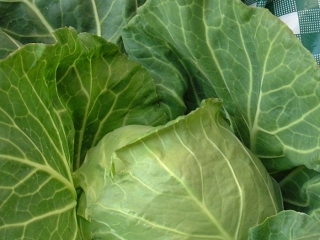 Excellent for fresh consumption and special meals as well and for pickling. Recommended for outdoor production. Fruits are globe- (cherry-) shaped, 3,0-3,5 cm tall, 3,5-4,0 cm wide, 3-4 locular, ripening from deep-green to deep-red; half erect-, hanging, strong peduncle, average weight of 30-35g, flesh is 1,5-2,0mm thick, strongly hot. It has great resistant of outdoor cultivation. 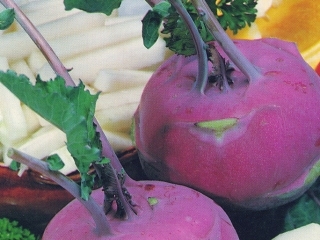 Early, transverse elliptic greenish yellow kohlrabi big non fibrous, tuber, enlarged stem, maturity days 50-60, for fresh consumption. Suggested for growing in early and summer open field. 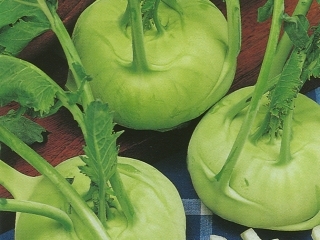 Medium early, globe pale green kohlrabi medium size non fibrous, tuber, enlarged stem, maturity days 60-65, for fresh consumption. Tolerant against arid climate. Suggested for summer growing mainly in open field. 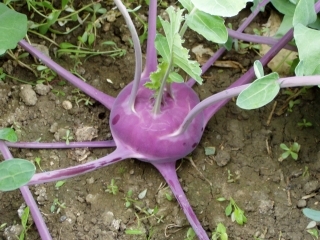 Early, flattened globe bluish violet kohlrabi big non fibrous tuber, enlarged stem, maturity days 60-70, leaf blade is rare bluish fresh consumption. Suggested mainly for growing mainly in open field main sowing time early spring. Early, globe bluish violet kohlrabi big non fibrous tuber, enlarged stem, maturity days 60-65, leaf blade is rare bluish for fresh consumption. Tolerant against the arid climate. Suggested mainly for growing mainly in open field main sowing time summer. 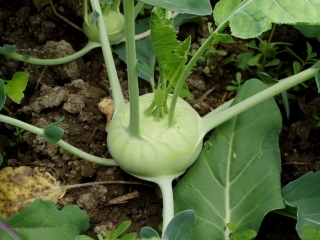 Late, flattened globe dark blue kohlrabi big non fibrous tuber, enlarged stem, maturity days 80-90, high yield, leaf blade is bluish for fresh consumption, goodstorage and processing. Non bolting, non fibrious. Suggested for growing mainly in open field main sowing time autumn. 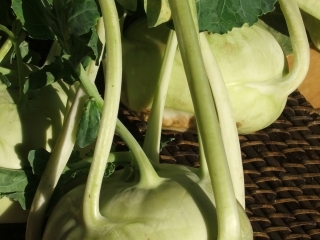 Early, transverse elliptic white green kohlrabi big non fibrous, non bolting, nonbursting tuber, enlarged stem, maturity days 40-50, for fresh consumption. Suggested for growing in open field and in protected area. 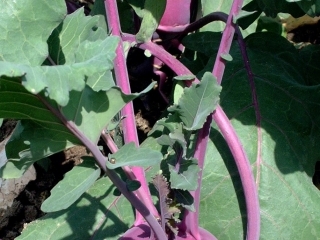 Early, transverse elliptic dark violet kohlrabi, tuber enlarged stem, maturity days 40-45, leaf blade is rare bluish for fresh consumption. Suggested for growing in protected area or open field sowing time early spring and in open field early autumn. 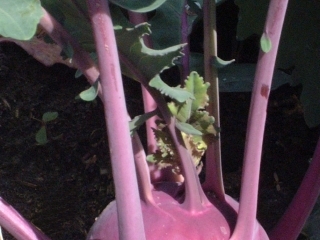 Early, transverse elliptic violet kohlrabi tuber, enlarged stem, maturity days 40-55, leaf blade is rare bluish for fresh consumption. Non bolting, non bursting, no fibrous tuber. 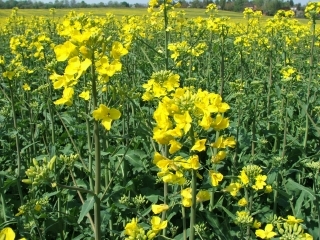 Suggested mainly for growing in protected area can grow in open field sowing time early spring and in open field early autumn. 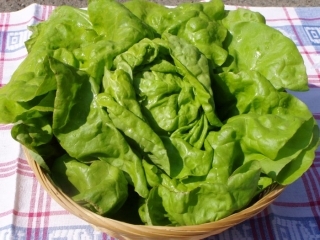 Early lettuce variety, traditional big, dense pale green in the leaves undulation of margin is missing on the surface the blistering is medium. Suggested for growing early in open field and protected area. 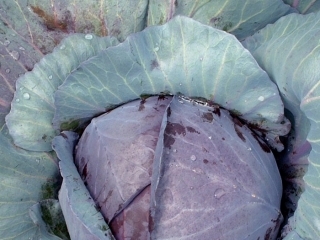 Its shape is elongated sphere, outer, dry coverleaves are thick, has more layer, bronze-red colour. Inner fleshy scales are ivory colour, solid of scales is excellent. It is fine for spice, dry material is 17-18%. It provides the real flavour of hungarian dishes and meals. Excellent storage ability. 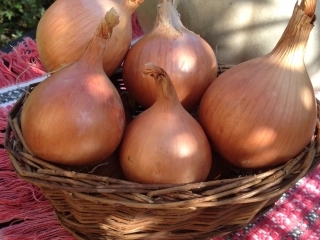 Traditionally, cultivated from set without irrigation, but sowing seed with irrigation, can be grow fine quality 5-7 cm diameter onion, which popular in the kitchen. 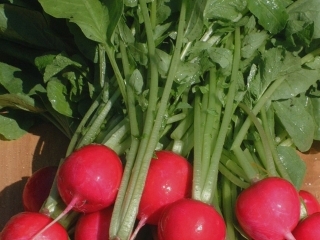 Medium early, globe vermillion color radish with white flash big size non pithy, firm, mild taste, maturity days 40-55, weight 30-450g. for fresh consumption. Suggested for early spring and summer growing in open field and for early and autumn protected area. 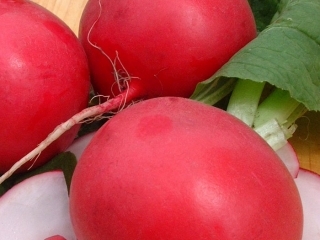 Medium early, globe scarlet color radish with white flash medium size non pithy, firm, maturity days 35-50, weight 20-30g for fresh consumption. Suggested for early spring and summer growing in open field and for early protected area. 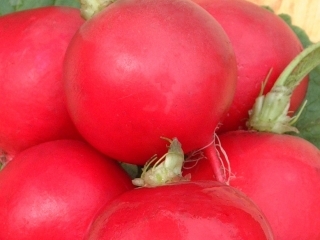 Early, medium oblate scarlet color radish with white flash medium size non pithy, firm, maturity days 35-50, weight 25-30g for fresh consumption. Suggested for early spring growing in open field and for early protected area. Early globe, medium dense headed dark violet variety, maturity days 85-95, for fresh consumption. Average weight, 1,5-2,0 kg. Bursting is late. Suggested for growing in open field sowing time spring and summer. Early greenish yellow, broad ovate headed variety, maturity days 55-60, for fresh consumption. Average weight, 0,6-09 kg. Suggested for growing in open field sowing time spring and summer. 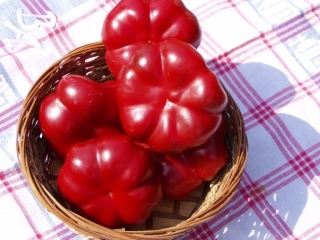 The most popular open-field tomato pepper. Early maturity, high yield. Xantomonas-leaf-spot tolerant. Large flattened spherical berries, thick-fleshed, from green to red is achieved. It is suitable for fresh consumption and industrial processing, too. Recommended for glasshouse or outdoor production. Light-green, long, sweet fruits are excellent for fresh comsuption, but also for pickling. 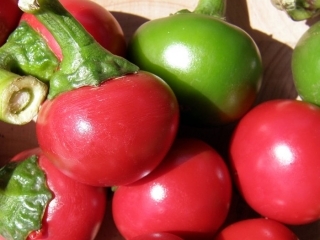 Continously, vigorously growing, suitable for early glasshouse and outdoor production. Fruits are deep green, its flesh is lovely sweet flavour. High yielding, excellent for fresh consuption. 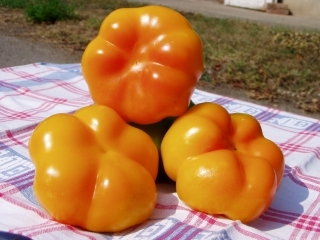 Sweet tomato shaped pepper. Very popular, Xantomonas-leaf-spot tolerant, indeterminate growth habit variety. 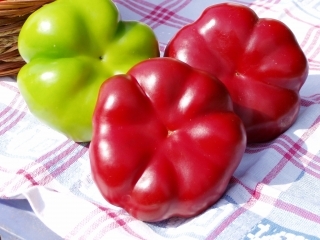 The fruits are flatted-round, middle-green turning to deep-red when ripes, sweet flavour whith high vitamin C content, average weight 120-130 gr, size 4-7 X 8-10 cm. 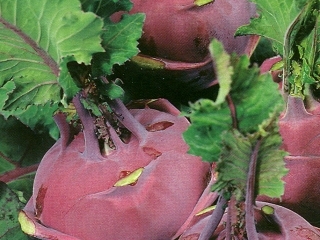 It is proposed for outdoor cultivation but also for forcing, very good for fresh consumption, canning, dehydration. 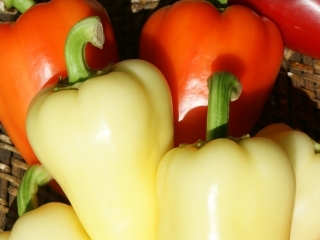 Sweet pepper, primarily recommended for outdoor cultivation. Its bush is average height and spread, vigorous growth. Fruits are flat-round shape, hanging, thick flesh, yellow-white colour, free of tending towards mauve, average weight is 85-110g. 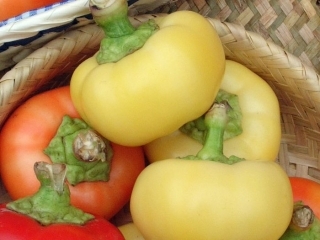 For industrial processing, pickling and fresh consumption. High yielding, virus resistant. Middle early, half-determine, medium growing, primarily for outdoor production, but for early glasshouse production as well, for filling. 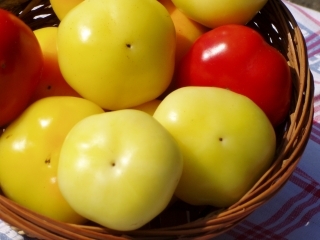 Fruits are whitis-wellow, hanging, lumpy, cone-shaped, with thick, pleasantly aromatic, sweet flesh. Can be kept on counter and cooked perfectly. 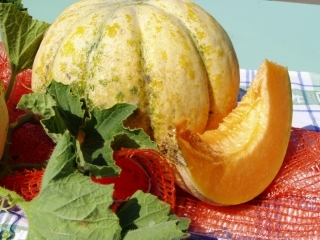 High yielding, with thick flesh, pleasant taste, ripen from green to orange. Recommended for fresh consumption. Constantly growing, for early glasshouse production but suitable for outdoor production. Fruits are ivory-white coloured, creased and curved, sweet, 20-22 cm long, average weight of 34-45 g. It has good productivity, attractive, recommended for fresh consumption, new variety. It does not discolor neither the effect of coldstress. The real miracle. The champion of the impetus, the stress tolerance and reliability. The modern, double 0 with a generative type kind till now his most typical embodier. (Genetically dwarf!) With the lowest stem altitude – but big pod layer with an altitude – with the kinds with a highest yield competitive with that plus, that the ferry of his earliness with safety can be harvested before the wheat. It is necessary to take care that it should not grow too early (going by landscape climate September before 1-10), because drawn intensive initial one sets off for a seed stem on a warm autumn through his development. Endures the frost well in a unsatisfying development state, but in the initial phases of setting off for the seed stem. Tipically it can adjust to extreme conditions. Its ability of production is above of late varieties, and it has not been outplayed in resistance of rolling. The smallest water demand is his speciality beside tenable on the longest foot. In weedless substance, on homogeneous soil ripening yet he does not need accelerating. Produces a particularly good result in years bringing the early heat in them when the later one, kinds with more protracted blooming get sunburnt quasi. Parolin is a unique hybrid beater. 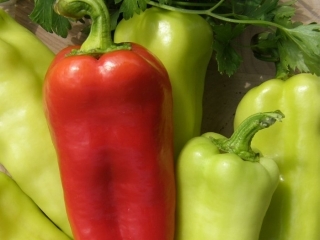 Tall - medium tall, middle long breeding season, good stem stability, extreme high yielding variety. 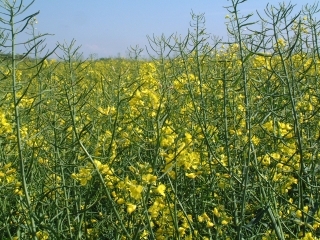 Its yield is 3,5-4 t/ha or above in good conditions. 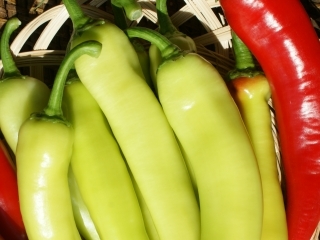 It worths to compete with any hybrid varieties. Its agricultural engineering claims (stem number, nutrient etc. ).